Congratulations! You’re now in charge. Perhaps it’s your first time as a leader, or maybe you want to fine-tune your skills. Either way, you’ve begun one of the most rewarding chapters of your career. But, like many beginnings, the first few years can be challenging. Fortunately, you don’t have to tackle this challenge on your own. Your First Leadership Job gives you practical advice straight from others who have walked in your shoes. Not only does it include dozens of tools to ensure your success, but it’s also based on the authors’ and DDI’s extensive experience and research, which ultimately has led to the development of millions of leaders around the world. In fact, a quarter-million leaders will be developed this year alone via DDI training. Your First Leadership Job is divided into two sections. Part 1 introduces the concept of catalyst leader—one who sparks energy, passion, and commitment in others. Your transition to catalyst leader is a major step in your leadership journey. 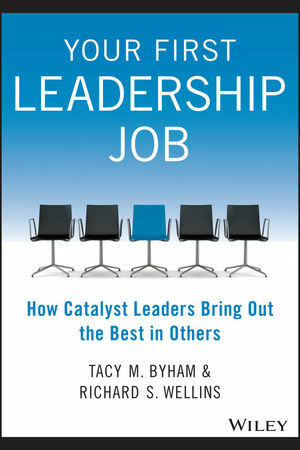 This book provides essential tips to put you on the catalyst path. Ultimately, leadership is about the many conversations—frequent, clear, authentic, and occasionally difficult—that you will have daily. Your First Leadership Job builds awareness of the fundamental skills you’ll come to rely on to make every one of these interactions successful. TACY M. BYHAM, PHD, is the CEO of Development Dimensions International (DDI). Tacy has worked with dozens of global organizations, creating custom solutions to improve their leaders' performance. She believes that better leadership is not only about the workplace, but also about better communities and, ultimately, a better world. RICHARD S. WELLINS, PHD, is a global expert in leadership development. Your First Leadership Job is Rich's fifth book on talent management, including the bestseller, Empowered Teams. His research has been featured in Fortune, BusinessWeek, CNBC, NPR, BBC, and Forbes. “We believe leaders shape great companies, so building great leaders is a key business imperative for Philips. These fundamental interaction skills lie at the very core of leadership.”—Peter Hope Head of Leadership Development, Philips International B.V.